During the mid-80s - at the height of the "pointy guitar" craze - a family of related guitars hit the market under the Hondo and Mako labels. For convenience, I'll refer to these as the "Death Dagger" family of instruments. 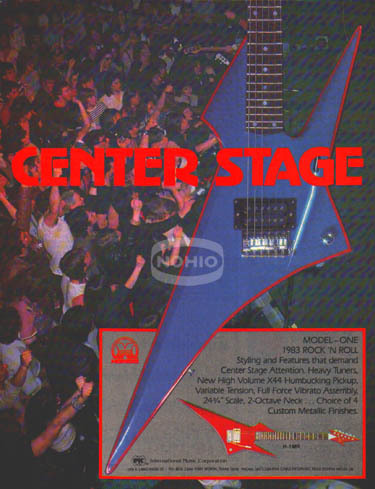 Hondo had an amazing catalog of guitars by the early 80s - with literally hundreds of models of guitars and basses available. A great number of these were copies of US vintage guitars, including of course the typical Les Paul, Strat, P-bass and Jazz Bass knock-offs, but also more obscure copies of Melodymakers and Danelectros, etc. But where Hondo really hit their creative stride was in catering to the blossoming metal guitar market. Hondo not only started selling outrageously shaped instruments but also all sorts of wild finishes, including prism/hologram finishes. Hondo's build quality also varied widely - with the cheapest instruments being bolt-ons almost guaranteed to end up with a warped neck within a year or so but with other lines having set-necks and Dimarzio pickups and even all mahogany construction. The cheapest models tended to come out of Korean factories whereas the better models were sourced from Japan. I'm not going into all the details on Hondo - there are various articles on the topic online - and its a big complex topic! But the set-neck Japanese Hondo's are pretty fine instruments - and can be real bargains. 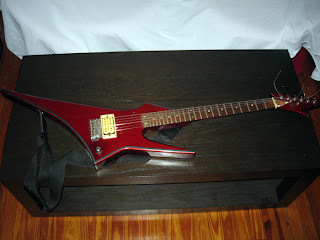 I still regret not buying a set-neck Hondo Korina Explorer copy that had a loose pickup for $99 back in the mid-90s - later realized it was probably a VERY well built Japanese instrument. The Death Dagger family was built in Japan - probably in the same Matsumoku plant where the better Aria and Westone guitars were manufactured - and were sold under the Hondo label as the one humbucker H-1 and the dual single pickup H-2. Initially, the H-1 was dubbed the "Death Dagger" - and the H-2 was the "Metal Master" - even though H-2's electronics and tremelo were better suited to playing surf-instrumentals!! Here's an example of a H-1 Death Dagger in metallic blue - it also came in red and black - and perhaps other colors? Here's a metallic red example - with blue trim - as pictured in the print ad. There was also a Death Dagger bass - I missed buying this beauty on Ebay - it sold for less than $200 - and it looks to be built just as well as the H-1 guitar, with decent hardware and finish and a similar form-fit hardcase. 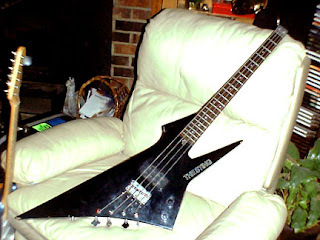 This is the only example I've seen of this bass - I'd love to acquire one if anyone out there has a lead on one !! The Hondo Sting appears to be a further evolution of the Death Dagger but with a headstock-less neck. Maybe too many lead singers were getting impaled or blinded by the Death Dagger headstock ? 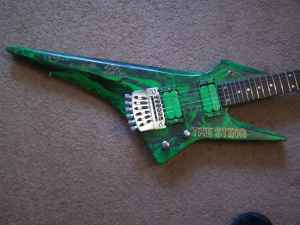 Or more likely - Hondo was jumping on some sort of "Steinberger-bandwagon". 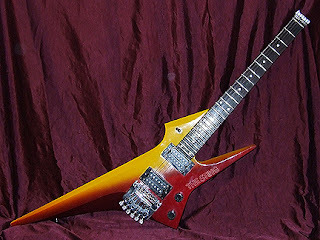 I've never seen one of these instruments in person but they appear to all be set-neck as well but with some very flashy paint jobs added - as well as body mounted tuners of course. "The Sting" was printed on the lower part of the body - and there was a bass version as well. If anyone has more info on these - or other variants - please let me know! The H-2 was also sold as the Mako XK-4 - which appears to be identical except for the headstock logo. The brand Mako doesn't appear to have anything to do with Hondo, so this was probably just an example of the manufacturer selling the same instrument to two different companies, who then applied their own brand. There's a more detailed write-up on this guitar in an older post, here. Note the form-fit case - with a sheepskin-like lining material !! 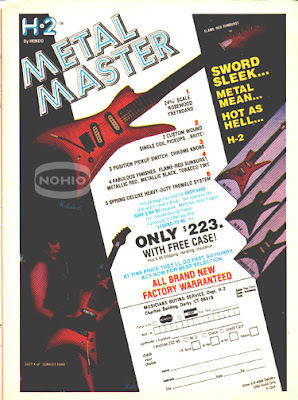 A little more research (mostly via Ebay auctions) has revealed that Hondo also marketed bolt-on neck versions of the H-1 and H-2 - presumably a few years after the set-neck versions and I'd guess as a cost-saving measure. These had the same body and headstock shapes but in both cases had the neck attached with 6-bolts. The Hondo brand went into hiatus sometime around 1987 (though it did re-emerge a few years later) and I'd guess that these bolt-on models are from around the end of the Hondo's existence - probably 1985 to 1987. And the bolt-on version of the H-2, which looks like its also had its "points" softened a little bit - maybe a safety improvement ? KILLER photos!!!!!!!!!! Awesome to see the vaeiations. Thanks for posting. Great info! Thanks so much for posting. Great article...I have the H-1 Death Dagger in Black with set neck. There seems to be some confusion as to the wood used. Does anyone know for sure? plywood' 100% plywood, however if you swap out for a hot Seymour Duncan Quarter Pounder P bass pup it does sound huge with a chimey top end.I added Schaller mini tuners for a more precise tuning and evryhing seems to hold up pretty well with the neck.I made my headless Sting 4string into an 8string by adding on a composite headstock at the but end.Still tryinmg to make the time to set the Dagger up shortly. I've got a blue bolt on neck H1. Found it at a flea market. It was being sold by a couple of fellas that had a music store in Ft. Worth, but were down in the Hill Country plying their wares. It plays and sounds great, but has some battle damage.